Nuu-chah-nulth model sealing canoe with paddles, bailer and spear. Made by David Frank, Ahousaht, 1964. RBCM 12047 a-g.
First Nations canoe styles and materials are highly specialized for use on rivers, lakes and ocean, as these models indicate. 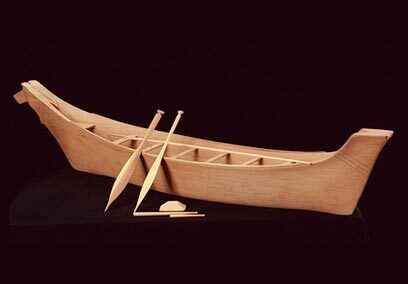 This is a photograph of a model of Ktunaxa-style sturgeon-nose canoe, with very pointed bow and stern. This is a photograph of a model of a Gitxsan ocean going canoe with wooden human figures. This is a photograph of a model of a Coast Salish racing canoe, with an option to zoom in. This is a photograph of a model of an Athapaskan-style birchbark canoe.